Acting - Tamara Henry, M.A. Tamara is an award winning producer with an inspirational documentary on the 2010 Oscar Shortlist for the 83rd Academy Awards and military films on both the 2012 Oscar Shortlist for the 85th Academy Awards and the 2016 Oscar Shortlist. She served as an anchor for the TV show "Metro Motion" nominated for the 64th and 65th Los Angeles Area Emmy® Awards - Metro Motion won the Emmy in 2014. Tamara studied basic Method technique classes with Ned Manderino at the Complex in Hollywood. Tamara has been honing her improv skills bi monthly at the LA Comedy Awards nominations soirees. Tamara is a member and actress for the Institute for Spiritual Entertainment Los Angeles, Conscious Cocktails, META and GATE. Tamara has also studied improv audition technique with Tom Ardavany of The Approach. Most recently Tamara took a class with Jeff Seymour. Filmed in Los Angeles in December 2003, Tamara plays a Delta Nu sorority sister alongside Reese Witherspoon in the "Delta Nu Invasion" parade scene in Legally Blonde 2. This photo is on the DVD box! Tamara plays "Rachel" in Man's Best Friend for Purina!!! Tamara is the lead actress with Bryan Barter who plays "Billy Olsen" Mark Zuckerburg's drunk roommate in the opening scenes of The Social Network. 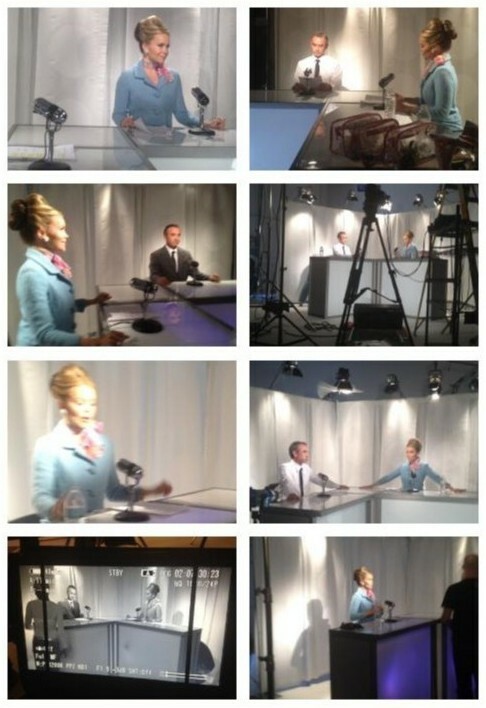 Tamara played the role of a trophy wife in this short film for ISE-LA. Michael Engel was the director. "Jimmy Chew" also had his first starring role in the film. Tamara plays a fuzzy "bridezilla" in Flower Girl. "Mysteries of the Apocalypse" was releaesed straight to DVD April 3rd, 2006. Tamara plays a news anchor for Ives Street Entertainment. Are the end times near? Find out when you watch our newest documentary released nationwide. Based on biblical scripture and expert testimony, you won't believe what has been predicted and what has happened. Mysteries of the Apocalypse. RENT IT NOW! Tamara worked with Javier Prato on this comedy short. Later Tamara met Javier again when he was one of the film-makers for the Elevate Film Festival December 2006. Based on a True Story: "KEMPER"
1998 Audition in Little Rock at The Talent Agency with Billy Bob Thornton for his film "Daddy an' Them"